Angry Bear » Healthcare and…. I thought I had seen everything, but that is astonishing and appalling. Scripps Health is sending $137 to collections that I have not paid because it was caused by their billing error and they have ignored my repeated explanations that all they have to do is bill my secondary insurer and they will be paid. And this with a patient who has provided them with more that $50,000 in revenue in just the past two years. And yet, living in California as I do, every time I suggest that “Health Care Reform” was not actually reformative, I am excoriated as some sort of right wing Obama hater. More than likely you are excoriated because your tiny billing problem means health reform sucked. I’m not sure what your response means, but when I make the comment about ACA not being reformative which draws the harsh response, my “tiny billing problem” is not part of the remark. I mentioned the “tiny billing problem” above, not because I care about the stakes of a lousy $137, but to illustrate the mindless greed of the health care provider. I assume you kept names, times, and dates of when you talked to some one and from what institute? I also suggest you send them a letter Priority Mail and recite what you said verbally. I had the same problem with a “provider” and it was all about billing my insurance company. They were late in doing so as I checked with my insurance company too. I was not being dunned and I did not have to take their supplies as I had adequate amount of them to last a while. Gotta tell you, I doubt anyone reads your first post the way you think they do. Case in point, Run’s comment. Not to mention your second post just makes it worse. Nowhere in your first post is there a single thought about a provider being greedy. Why it shows up now is a mystery to me. Not everything in the world is the result of neoliberalism. Issues like this have existed for a long time and have a habit of being obscured by falling under this over used moniker. What has been happening and Spectrum is following the same path as many other pharmacies, hospitals, clinics, insurance companies, etc. is consolidation. CVS merged with Aetna, UnitedHealth Is Buying a Major Doctor Group DaVita, etc. There is numerous large consolidations going on in order to control the market place and negotiate. Name brands like Hopkins, University of Michigan, Cleveland Clinic, etc. can also charge higher prices because of who they are and not necessarily because of the better quality care they provide. The prospect of having to negotiate with Medicare or the government on more pricing is a threat and size counts. Back to the topic, what comes first the operation or the drugs. The patient had a $4500 deductible which more than likely needed to be solved to pay for the operation. After that, the insurance picks up all the cost from what I read. 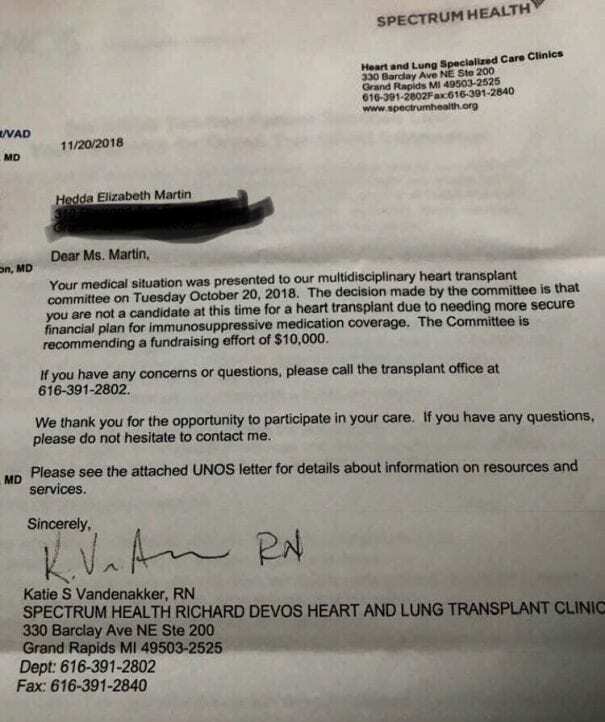 Maybe the DeVos’s are afraid they will get stiffed by the patient for the $4500 to operate. A big hospital operation like Spectrum Health most certainly has the funding to finance this. It isn’t like one of the DeVos’s going to England and butting in line to get quicker service and being able to do so because of forking over a few thousand “quid” on the side. not sure of the financials of this person and if the heart was so bad, why would you take a high deductible? Gold plans have become lesser in cost doing to Trump trying to screw people by canceling the CSR. Charles Gaba talks about this being the case for does who are subsidized and those who are not. Too much missing information. I did find an open letter to the new President of Spectrum Health, Tina Freese Decker as written by Lody Zwarensteyn at Healthcare Blog. It is a good read and it points out what has taken place at Spectrum Health as it abandoned its orginal role in Western Michigan as a quality low cost healthcare provider to a modern role of rent taking. Not pretty; but, it is very true in healthcare. Understand that Spectrum Health grew out of community expressions. West Michigan’s health care long had been a leader among state and national communities. But local community leaders, tired of senseless rivalries among its major hospitals, urged the hospitals to get together and concentrate their strengths to better serve the community. Spectrum Health owes its existence to many community leaders who saw a great opportunity for the West Michigan health care scene to reach new heights. One of its guiding principles was a “local first” mentality. Initially, a stated goal of Spectrum was to keep the efficiencies of West Michigan within the area, returning the benefits of thrift, great care and low prices to the community that created it. West Michigan has long been admired for its strong work ethic. Conscientious employees believe in returning a fair day’s work for a fair day’s pay. Employees of Butterworth and Blodgett hospitals, which combined to form Spectrum Health, were instrumental in building the two fine institutions that had national reputations. Yet in recent years, somehow those local people who were good enough to develop the renowned institutions seemingly weren’t good enough to run them, and we entertained a host of administrative staff from other areas who brought a different ethic. This has resulted in changed senses of accountability. West Michigan, and Spectrum’s components, previously had a solid reputation for being price leaders in the state and nation. That seems to have changed in more recent times, and it’s time to bring back the price advantages that West Michigan had enjoyed. At one time, Spectrum’s charges were the lowest in the state. Since then, prices have gone upward — to being in the “bottom quartile,” then to being in the “lower half,” and now Spectrum claims to be “competitive.” Compared to other areas, West Michigan seems to have lost its price advantages, and this is not returning efficiencies to the community. It’s time to restore the price advantages. Current profit margins and the opportunity to more efficiently use assets could provide the opportunity to reduce charges. Spectrum operates a network of satellite hospitals, and it should use them to provide cost-effective care in local communities, rather than bringing some patients for routine care to its higher-priced specialized (tertiary) institutions. In fact, most hospital admissions are for routine care, not for specialized care. The tertiary institutions should be saved for tertiary work. Spectrum Health provides an insurance carrier — Priority Health — that was specifically intended to keep local price advantages within West Michigan. Somehow, it now services larger parts of the state’s population far outside Spectrum’s service area. This is not keeping things local. Additionally, Spectrum appears to favor Priority Health to the detriment of other insurers. Other insurers purport difficulty in obtaining contracts with Spectrum that come close to the deals it makes with its own insurance company. This is not fair to customers. Local care long had been defined by recognition of specific strengths by various health care providers and sharing among them. Collaborative relationships among medical practices and institutions had been a hallmark of West Michigan. Several local centers of excellence had evolved. Spectrum’s administrative leadership, however, seems to have developed a belief that only what it provides is worthy, rather than recognizing others’ strengths. This has led to some needless duplication of some services that is not only costly, but undermines quality of care. Collaboration and referrals that recognize all strengths wherever they are is needed once again. For example, world-class rehabilitation is available at Mary Free Bed, but Spectrum’s employed physicians are purportedly discouraged from referring there. Physicians should be free to refer their patients to the most appropriate provider, regardless of ownership. Cooperation is also needed in medical education and research. Spectrum may have used its large market position to jostle and divide the local inter-hospital medical education and research programs that had been working together for decades. The biggest opportunity Freese Decker has before her is the chance to restore the servant mentality to the institutions. Initially, our hospitals were organized by local leaders to serve their communities. The community leaders with names like Butterworth, Blodgett, Meijer and DeVos never intended their gifts to create a local monopoly to the detriment of others. They took part in local happenings and sought to advance community interests. They were responding to community needs. But in more recent times, Spectrum seems to have taken on a mentality of dictating rather than asking. It has used its size to cast a dominating image in the community. Regardless, looking ahead, the future for Freese Decker is bright, and we wish her the very best. Your repeated attempts to make me a bad guy are baffling. What did I say to offend you? “Scripps Health is sending $137 to collections that I have not paid because it was caused by their billing error and they have ignored my repeated explanations that all they have to do is bill my secondary insurer and they will be paid. And this with a patient who has provided them with more that $50,000 in revenue in just the past two years. Perhaps you should find an editor that can diagram your posts so they make sense, as opposed to saying something you say you didn’t say.